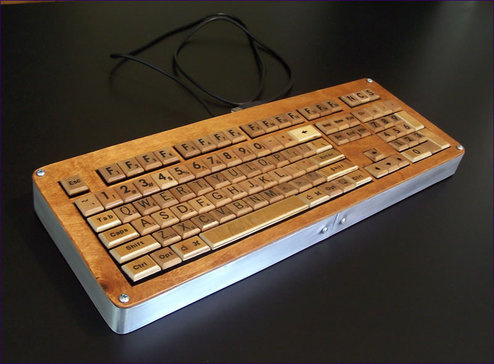 Master Wordsmith Crafts A Scrabble Keyboard | OhGizmo! I’m something of a geek and (as you might have noticed) a writer too. I think there’s something about both of these qualities that attracts one to the game Scrabble. I love learning new words, but even more I enjoy using those words as powerful tools on the Scrabble board. Granted, I don’t actually play all the time, but one aspiring fanatic went well out of their way to show their devotion to this wordsmith’s game. Apparently one day it dawned on a few people that the little wooden game pieces were small squares, roughly the same size as the keys on an average keyboard. So why not use them to create a custom keyboard? Well there are several obstacles here. Namely, there’s no “Enter” piece in the game of Scrabble. Instead they contacted a friend and persuaded him to hand-craft this masterpiece laid out before you. Each key was hand-beveled, and he went so far as to make the Caps Lock and Num Lock keys have lights that shine through when enabled. This was originally just a one-off piece, but yesterday the creator put up a little note on his site. Since so many people have taken an interest in his work, he is considering making a small batch of these to sell. The biggest hurdle is whether or not he’s going to have Hasbro banging on his door for doing so.